Oh man, you got me there. The very posing of this question clearly illustrates that the one asking has no clue as to the goal of treatment free beekeeping, which is to allow non-pest-tolerant bees to remove themselves from the local gene pool. Rant alert: If you’re a sideliner or commercial (treating) beekeeper, I don’t ever expect you to understand. The thought of losing bees, and losing revenue in the process, will forever cloud your ability to consider keeping bees without treatments. I’ve been told that I don’t care about bees since I do nothing to prop up inferior colonies. I say the opposite is true. By treating a mite-ridden colony, you have basically dragged those genetics, kicking and screaming, into the next generation of bees. I don’t keep bees for money. It’s my hobby and I’m not ashamed of that. My ideal number of colonies is about 10. So what do I do? I kept thirty this year. Will I lose a bunch? Well that depends what you consider a loss. A colony that can’t hack it, that eventually gets robbed out, and dies over winter, or before, is not a loss to me. In fact, if all thirty were to survive, I would be a little concerned. I want the weak ones to (for lack of a nicer word) die. They tell me I’ll have 50% losses treatment free. Well, good. 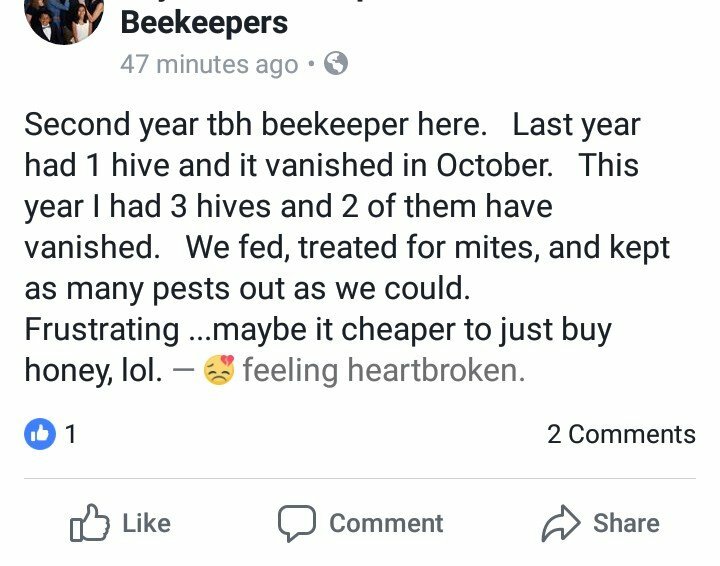 A treating backyard beekeeper will buy, say, 5 colonies, and then move heaven and Earth to try to keep those 5 alive and then cry on Facebook when things look bad, mostly because of the money spent on those bees. And if they lose only one, that puts their survival rate at 80%, absolutely unacceptable to a commercial operation. If I lose 20 (highly unlikely) I’m still at my preferred number of colonies and now have a bunch of empty equipment to do what I love, which is catching swarms and doing cut-outs to keep or give to others. And the ten or so that do survive, I can be sure that they are no slackers, having survived the same conditions that put 20 other colonies to eternal rest. Will a commercial or sideliner beekeeper be impressed with my thoughts on keeping bees this way? Oh heck no. They would get a good belly laugh. But the truth is, they only care about bees because bees bring them money. They care about bees the way KFC cares about chickens. I find it interesting that backyard chicken keepers don’t call Tyson Foods or Perdue to ask how to breed better chickens. I wish more beekeepers would stop asking the Tysons of beekeeping how to manage their small apiary. In summary, keep more bees than you want, stop buying bees, stop being part of the problem and start being part of the solution. You are definitely not alone anymore. And what’s my survival rate? Whatever you want it to be. Seeing alot of this lately. As a “Treater” one might ask why I enjoy reading an article such as this. Well, it’s because I appreciate that you have thought out such things. That you employ logic in your reasoning. And that I can gain in exploring a your methods, reasoning, and application to my own management. Thanks for the article and eagerly awaiting Part II. There are plenty of commercial treatment free operations. I read of one that kept 2000 colonies. They also did pollination treatment free. It can be done.